Uzbek President Islam Karimov called the Uzbek labor migrants engaged in sweeping streets in Moscow “lazybones” and “street beggars.” Perhaps, President Karimov’s words were addressed for the local audience, for “local consumption” so to speak. The online media outlets in Uzbekistan appeared embarrassed for their leader’s harsh and strange claims having decided not to reprint his statements. The part about “lazybones” would not have made its way into the “foreign consumption” copy of the interview if not for vigilant foreign news agencies. BBC Media Monitoring was the first to pay attention to this strange, to put it mildly, statement the Uzbek leader uttered during his trip to Jizzak Region on 19 June 2013. The Ozodlik Radio later carried the video clip below on its website Monday. The Fergana News Agency has its own translation of the Uzbek president’s statements. It is not the first time President Karimov paid attention to labor migrants traveling abroad to seek employment. He spoke in similar vein several months ago upon learning about the fate of an Uzbek janitor who has beaten up a boy in Moscow for throwing snowballs at him. Back then the president blamed the minister for internal affairs for the situation. Rapping the minister resulted in heightened control at border checkpoints in attempts to identify labor migrants. Frankly put, labor migrants now have to bribe to leave the country. Uzbek President often allows himself making such non-prescript statements. Such impromptu throw off simultaneous translators and speech recorders (typing speech into a text) and editors of official mass media. “One doesn’t know what to type. He starts a sentence with one idea, but finishes with a totally different one. He often uses colloquialism, not curse words, of course, but unofficial vocabulary that is inappropriate for heads of state,” an editorial employee journalist says. Indeed, President Karimov’s words mostly contradict one another. Take this very speech, for example. How can one call somebody “lazy” when the latter is traveling to a foreign country to sweep streets there? Or are they there for “a piece of bread” indeed, because they cannot earn it at home? Also, they are well paid for their “lazy performance?” And that is “disgraceful?” The official Uzbek mass media usually let such “impromptu” statement fall through crack on the floor. This case was no exception. The official information circulated by the main news agency of Uzbekistan, the UzA Agency, reprinted by all the mass media with no exceptions, contains no word about President Karimov’s attitude toward migrants. It only speaks of the country’s success stories “under the wise watch” of the irreplaceable Uzbek leader. The father of the nation’s phrase turned into another joke among the populace in yet another demonstration that he is far from the miserable lives of the common citizen. 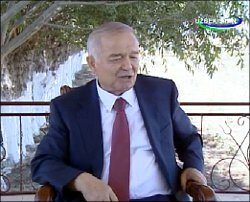 President Karimov, apparently, only learns about the latters’ “happy and prosperous” lives on Uzbek TV news and rosy reports his complacent officials file. Meanwhile, President Karimov’s claims stirred a storm of raged among hardworking Uzbek migrants abroad. The Ozodlik Radio’s interlocutors and commentators on its website reacted telling their stories about factors that forced them to leave close people and travel to foreign lands seeking jobs. One of the most frequently mentioned factors was the lack of appropriate jobs back home, an inherent desire to somehow provide for the family and help children find their place in life. In short: We had to leave in order to survive! It would benefit the esteemed president and other officials in his entourage to remind the dire consequences that would have inevitably befallen the Uzbek economy if not for the multimillion-dollar transfers these very “lazybones” send from abroad. In 2012 alone, according to the Central Bank of Russia, they provided bout 6 billion USD to the Uzbek budget! The excerpted quote above clearly shows that reality is something removed and remote for Uzbek President Karimov, the inadequacy of whose statements is obvious for the common Uzbek resident.